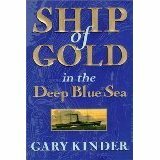 A few years back, Gary Kinder wrote a terrific, non-fiction page turner called Ship of Gold. The book centers on a free-thinking scientist named Tommy Thompson who took a decidedly unorthodox view of what’s possible and impossible; he believed people have a tendency to label things ‘impossible’ not because they couldn’t be done, but because no one has yet done them. To Thompson’s ever-curious scientific mind, most challenges amount to overcoming a series of nonexistent barriers. This mindset drove his daring and innovative deep sea salvage of the “Central America”: a side wheel steamer returning six hundred people and an estimated three and a half tons of gold from California in September, 1857 when it went down in a hurricane, two hundred miles off the Carolina coast. The story of Thompson’s obsessive quest to first locate the ship’s remains in 8000 feet of water and then recover the treasure at those crushing depths amidst the powerful Gulf Stream makes for a compelling read. But Tommy Thompson isn’t driving this post. Actually the Captain of the “Central America,” William Herndon, demonstrated extraordinary heroism goping down with that ship after fighting through three horrific and relentlessly-violent days. His valor earned this inscription on a memorial at the US Naval Academy: “Forgetful of self, mindful of others, his life was beautiful to the last; and in his death added a new glory to the annals of the sea.” Now a few years before his awful final moments, Captain Herndon trekked from Lima, Peru to Para, Brazil under orders to explore the Valley of the Amazon, from its headwaters high in the Andes down to the Pacific. His account of that yearlong expedition so far exceeded the Department of Defense’s expectations, they published it and all of it’s compelling, firsthand accounts of adventure and invaluable scientific discovery and documentation. But actually, Captain Herndon isn’t driving this post either. The ultimate point is that Herndon’s book, Exploration of the Valley of the Amazon, rendered this exotic land so vividly that it inspired a young man in Keokuk, Iowa to quit his job at a printshop, and travel from Cincinnati down the Ohio and the Mississippi to New Orleans. His head filled with dreams of Amazonian adventure, he hoped to catch a ship in New Orleans bound for Para, Brazil and make Herndon’s journey in reverse. A compulsive curiosity drove him to go out and experience more than Iowa offered. And those adventures, while far different than the exploits he’d imagined, would provide the inspiration for classics like Tom Sawyer and Huckleberry Finn. Truth be told, Mark Twain didn’t drive this post either. The common defining character linking all these diverse men is an undeniable curiosity. Curiosity is powerful stuff. And it makes all of us better. Or at least gives us better stories. And advertising always needs better stories. Nail biting post – wondering how the dots connected. Very interesting Dennis and a lesson I hope to teach my daughter. Honestly, this is one of my favorite non-fiction books simply because it is a truly ripping tale of history, science and the sea. Great, great stuff–check it out Joe. And thanks for the comment.